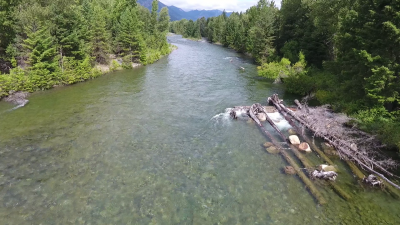 Upper Kachess River dewaters most years cutting off bull trout in Kachess Lake from important reproductive habitat. 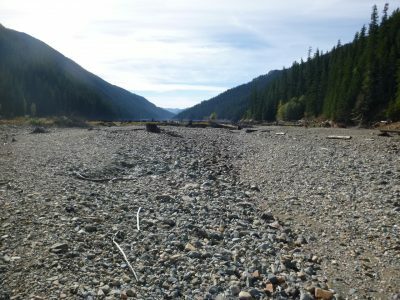 KCT is the only local land trust that has a unique role in conservation and restoration efforts in the upper Yakima River basin. The upper Yakima Watershed provides much of the water that supports fish, agriculture, and communities within the Yakima Basin. -In addition, the Central Cascades is home to a diversity of habitat types that support a similarly diverse array of critical habitats. These unique habitats are home to endangered wildlife ranging from bull trout and Mid-Columbia Steelhead to northern spotted owl and wolves. We believe the pathway to species recovery is through protection and restoration of essential habitats and maintenance of critical wildlife migration corridors. Kitititas County is the 10th fastest growing county in the country. Kittitas’ location “just a latte away” from the booming Puget Sound region and in the geographic center of Washington influence its rapid growth. The current I-90 corridor expansion project from Stampede Pass to Easton is encouraging more growth and development in the upper Yakima Basin. As a result we will see further risk to critical habitats and migration corridors. A 2015 study estimated the county’s population will increase from approximately 42,500 people to 65,000 in the next 20 years. Of that growth, 40% will take place in rural areas (around 9,000 people). This drastic increase could greatly impact our ecosystems. 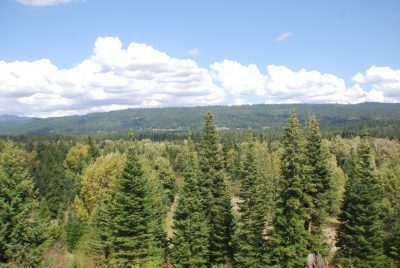 Conversions of former landscapes, such as private timberlands and agriculture lands to private development, have a long history in Kittitas County. As such there is significant need to ensure that important ecosystems are conserved. These key areas support the diversity of species that thrive in our basin. Additionally, they provide critical movement corridors that connect forests, floodplains, rivers, and shrub step habitats. Since KCT is locally based, we recognize our role in the community and pay property taxes on the lands we own. For this reason, KCT can partner with private and public stakeholders to work on important acquisition projects with county support. 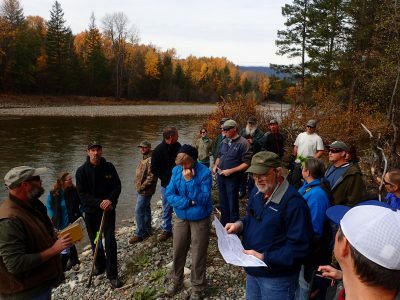 These partnerships are protecting critical fish and wildlife habitat, species migration corridors, and ecosystem function and values in the upper Yakima Basin. KCT holds easements along several miles of the Cle Elum River corridor. KCT works with interested and willing landowners to protect lands and waters with high conservation values from development that could compromise their natural functions. Tools for preserving our lands are direct purchase of land or acquisition of conservation easements. Land purchase funding typically comes from a variety of sources including government and foundation grants, and private donations. At the time of purchase, KCT sets aside funds in the form of a land stewardship endowment. Endowments ensure we can maintain and enhance the conservation values of this land. Equally important, endowments can provide educational and recreational access to the public where feasible. KCT manages over 3,000 aces of easement land in the Suncadia Resort. Conservation easements are restrictions a property owner voluntarily places on a piece of property. Easements are designed to protect specific conservation values. For example, a landowner might agree to restrict further development on the property. Conservation easements are donated or sold by the landowner to KCT. The conditions are negotiated and agreed to by the property owner and KCT. These conditions “travel with the land,” meaning the restrictions apply to current and future owners of the property. Easements allow land to remain in the hands of a landowner who can continue to utilize the property subject to the restrictions agreed upon. Take a look at some of our featured protection projects on our Projects Page. 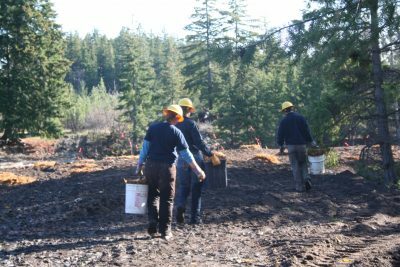 Washington Conservation Corps workers planting vegetation for a riparian restoration project. Salmon, steelhead, and bull trout populations in the upper Yakima River Basin face many challenges. Degradation and alternation of river and stream habitat is one of the gravest. For this reason KCT focuses on identifying priority projects that restore natural processes and create habitat for these species. Our restoration projects are located in river, floodplain, riparian, wetland, and upland ecosystems. They can consist of replanting stream banks with native trees, reconnecting floodplains and side channels, and adding large wood and other in-stream structures to slow water and create “resting” pools. KCT works with neighboring landowners along rivers and streams. Our projects often help decrease flood risk. Moreover they create added opportunities for wildlife viewing as fish, birds, and elk begin to use newly created habitat. 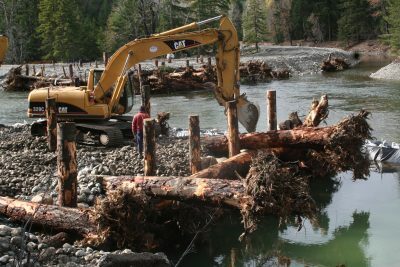 Projects can require the use of large machinery such as diggers and helicopters to move the materials needed to improve habitat. Projects are often tied to regional planning efforts to implement significant projects in critical watersheds. 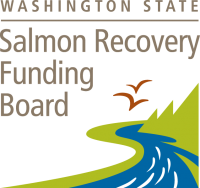 These plans include the Yakima Basin Integrated Plan, Yakima River Steelhead Recovery Plan, and the Bull Trout Action Plan. Through partnerships with local agencies, landowner, and stakeholders, KCT brings needed capacity to successfully plan and implement large-scale restoration projects to address regional recovery goals. You can learn more about our restoration projects on our Projects page. Participants touring a project that demonstrate the impacts of the work and the benefits for wildlife. Without local community and public support our work is not possible. 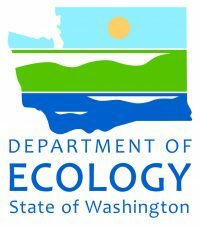 Through outreach and education we inform our community and visitors about the unique landscapes in the upper Yakima Basin. We focus on building relationships with our local community that empower them to steward their lands. KCT’s unique history and ability to mobilize resources, our organization is able to meet community needs effectively. One great outreach outcome is our relationship with the Cle Elum Middle School. In 2017 KCT took middle school students to a restoration site for release of their Spring Chinook salmon. Each year, classes raise salmon in their classroom as part of their Salmon in Schools Program. During this field trip KCT staff learned their classroom’s salmon rearing tank needed updated equipment. KCT purchased the materials to support the continuation of the program in 2018.